What's a mud dauber, you ask? The daubers are a type of wasp that builds its nest from mud, which is in keeping with the southwestern style of adobe architecture. As a matter of fact, mud daubers were building adobe homes a long time before human beings showed up in the area. Actually, the mud daubers build nests rather than homes. When they construct the nest, they lay a single egg in each room and then pack the room full of small spiders that have been paralyzed by a sting and will serve as food for the young daubers as they grow. When the daubers are full grown, they dig their way out of the nest and begin their search for a place to start their own family. When Luckenbach was built, the daubers found that, if they built their nests under a roof, the nests would not get wet and melt when it rained. Hondo Crouch liked mud daubers because they ate spiders. Hondo did not like spiders. He said, "Spiders SCARE ME!" So it was a good relationship. Hondo decided that when the mud daubers came back to Luckenbach in the spring, there should be a festival to welcome them. And that's how we got the Mud Dauber Festival. Chili came to Luckenbach when Hondo held his first "Lady's Chili Bust". That was 1972. The Chili Bust was one of Luckenbach's biggest events. It continued for over thirty years until it finally outgrew Luckenbach. This year, on the 24th of March to be exact, chili returned with political correctness. It was open to gentlemen as well as ladies. I was invited to be a "celebrity" judge, as Governor Perry had a previous commitment. The chili was divided into two categories: regular chili and "Old-Time" chili, the difference being that regular is what competition cooks are cooking these days, and Old-Time is the way chili was cooked before the cook-offs got to be so important. There was a good crowd on hand at Luckenbach. There were fourteen Old-Time chilis (about a dozen more than were expected) and twenty-nine of the regular cooks. I was summoned to judge the Old-Time chili at high noon. (That's 10 a.m. in California.) Also seated at the judging table were Allegani Jani Scofield, who was the first woman to win at Terlingua, Jo Ann Horton and Rocky Caliche. All have been in the game longer than I have. Also, we had Jeff and Dani Ritchey of the Ritchey dynasty and a couple of more I didn't get names of. The chili samples proceeded around the table, stopping in front of each judge, awaiting the sentence. Each sample was in a Styrofoam cup identified only by a judging number that had to be matched to our score sheets. Each judge used a clean spoon to get a sample out of the cup. The sample was checked for aroma, color, tenderness and flavor. You could not double dip. If you wanted another taste of the chili you had to get a new, clean spoon. After you passed the sample to the next judge, you could not call a sample back for another taste. The sound system for the dance hall consisted of a bullhorn that was found in a dumpster after the 1968 Watts riots. It left something to be desired. There was some discussion of the merits of the chili as it traveled down chili row. I thought all the samples were too salty. Jo Ann Horton said all the samples were different, and I will agree with that statement. It did not take more than twenty or thirty minutes for the Old-Time chili to get judged. The highest scoring samples were set aside under guard until time to unveil the winning number on stage. The head judge thanked us politely, and we were dismissed for the time being. I thanked the head judge for having decent palate cleansers in the form of crisp saltines, very nice fresh grapes and the icy cold beverage of our choice. We were told to be back at 2 p.m. to judge the finals of the regular chili. There were twenty-nine regular chilis, which meant they would have to have two tables of judges as we always try to have more than fifteen samples for each judge. The top seven chilis of each of the preliminary tables went to the final table. So us celebrity judges got fourteen more chilis to pass judgment on. I am not a fan of the regular chili (see Goodbye, Old Friend Chili). However, as a Texian and a gentleman, I am honor bound to do my best. All the judges agreed the chilis were rather similar. There was one that was on the edge of being a spitter. I don't think I have to explain that. In about an hour, all the winners had been selected. It was decided to hold the awards ceremony in the dance hall as the logistics of getting thirteen chili cups and the trophies out to the main stage were just too much of a hassle. First order of business was the Chili Bowl Awards. The Chili Bowl Awards are long-standing honors given to persons or places that have made significant contributions to the chili and chili cook-off world. Recipients of Lifetime Achievement Awards were The Ritchey Family of Garland, Texas, and Fred McMurry of Montgomery, Texas. Luckenbach Texas Inc. received an award for support of the chili world. The Chili Bowl Awards Chairman announced the formation of the Chili Bowl Awards Hall of Fame. All receiving Lifetime Achievement Awards go into the Hall of Fame. A list of posthumous awards was read. Then, the serious awards began. In the Old-Time category, there was a three-way tie for first place. (You do remember the first cook-off at Terlingua ended in a tie?) The three winners were, in no particular order, George Pearce of Johnson City, Reve Weatherly of Canyon Lake, and the team of Blue Nall and Blaze Richards from Austin. Each of these two lads has a split personality, so it takes two of them together to have one personality. First place in the regular cook-off was Rand Rheinhardt of Canyon Lake. This win qualified Randy to cook in the big Behind-the-Store Original Tolbert World Championship Chili Cook-Off this coming November in Terlingua. First place showmanship winner was Laury McCullough of Austin. Laury and her Dead Boot gang have a lot of showmanship trophies. 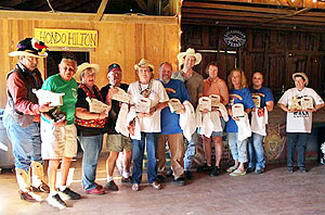 Each of the top ten winners, the top three showmanship winners in chili and the three who tied for first place in the Old-Time chili division each got a brand new, unworn Texas Cooking T-Shirt. We hope to see Texas Cooking show up at more cook-offs in the future. In summation, ladies and gentlemen of the jury, let me say the 2012 Mud Dauber Festival & Chili Cook-Off at Luckenbach, Texas was a fun affair. There were a couple of glitches that are already being worked out. The mud daubers did not get much notice. The band on the outdoor stage had a good audience all afternoon. The high point of the concert was when one of the spectators got bombed by one of the Luckenbach Tree Roosters. This got a big round of applause. Perhaps the rooster was stung by a mud dauber causing the release. I plan on going for the next Mud Dauber Festival & Chili Cook-Off in March of 2013. Hope to see you there.